WASHINGTON -- The Chinese ambassador to the United States is a man of considerable skill and diplomacy named Li Zhaoxing. A linguist before becoming a diplomat, Li is a man of formal manners, especially in his speech. I went to a talk he gave the other day, and afterward, he took questions. Before and after answering each question, he thanked the questioner warmly. Except once, and that was when I asked him about Tiananmen Square. 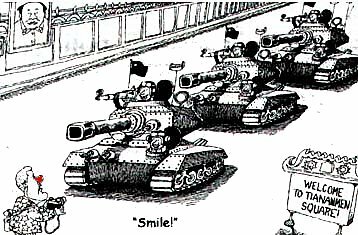 In 1989, hundreds of unarmed, pro-democracy students and workers were shot and killed by Chinese troops on the approaches to and in Tiananmen Square. It was after this massacre that the United States placed new sanctions on China, sanctions that some in the Clinton administration now would like to remove. But when Clinton arrives in Beijing next week, he will go to that square to be greeted by his Chinese hosts. A number of members of Congress from both parties, as well as human rights activists, have urged him not to go there because they see it as the Chinese government using an American president as a puppet. Clinton says, however, that it's the Chinese government's party and he has to be greeted where they want to greet him. So I asked Ambassador Li the following question: Since the Chinese government knows what a political problem it is for Clinton, why do they insist on Tiananmen Square as a greeting site? This time, when he began his answer, Li did not include a thank-you. "We are proud of the square," he said, "for it is a symbol of the capital city of China. Why do you receive your foreign heads of state on the South Lawn?" And Li did not end with his customary thank-you. Instead, he said to me: "Is that clear, sir?" I told him that I thought it was clear. But because I wasn't there to argue with him but to report on him, I didn't go on to say what I think should be obvious to him: The United States did not slaughter innocent people on the South Lawn of the White House, and that is one big difference between it and Tiananmen Square. But even if I had said it, it would not have made any difference. Bill Clinton is going to China, and he is going to be greeted in Tiananmen Square, and no doubt, he will speak out strongly on human rights, letting other people sort out the symbolism. All this is because the great difficulty for Bill Clinton and other Americans who want to figure out China is to decide just which China they are dealing with. China is neither friend nor foe, ally nor enemy. It is the country that manufactures the Tickle Me Elmo dolls our children play with and the country that has nuclear missiles targeting our cities. It is a country with more than a billion people that U.S. firms would like to sell more goods to, but it is a country that currently sells $50 billion a year more to us in goods than we sell to them. It is a country that rockets U.S. satellites into orbit so that CNN and other uncensored U.S. media can broadcast around the world, but it is a country that suppresses free speech within its own borders. It is a country about which President Clinton asks: "Are we better off working with China or without it?" And it is a country about which Gary Bauer of the Family Research Council asks: "How would it feel to have your fingers crushed and broken with a pair of pliers because you believe in the lordship of Jesus Christ?" China is, in other words, different things at different moments to different people, as Clinton made clear last Thursday in a speech unusual both for its length and its defensive tone. Clinton spent a half an hour telling an audience at the National Geographic Society that his trip to China, planned for June 25 through July 3, was a good idea. While virtually nothing he said was new, what was newsworthy is that he felt the need to say it at all. "Some Americans believe we should try to isolate and contain China because of its undemocratic system and human rights violations," he said. "Some believe increased commercial dealings alone will inevitably lead to a more open, more democratic China." But Clinton's speech was barely over before U.S. Sen. Connie Mack, a moderate Republican from Florida, issued a statement attacking Clinton for setting up two false extremes. "We are not forced to choose between engagement and isolation," he said. "The problem is that President Clinton's engagement of China appears more like capitulation." Clinton characterized his approach as "principled and pragmatic," however, defining it as "expanding our areas of cooperation with China while dealing forthrightly with our differences." Clinton lavishly praised China for condemning the nuclear tests of India and Pakistan, for being a "force of peace and stability" on the Korean Peninsula and for being "a helpful partner in international efforts to stabilize the Asian financial markets." "Would our interests and ideals be better served by advancing our work with or isolating ourselves from China?" Clinton asked. In China, the official view is clear: America is showing its great respect for the Chinese by sending its president there. "The Sino-American relationship is one of the most important bilateral relationships in the world, if not the most important," a senior Chinese government official told U.S. reporters in Beijing not long ago. Another senior Chinese official said: "The very fact that Clinton will travel all the way across the ocean to China to pay respect to this great nation will be appreciated as a sign of friendship and goodwill." The official also said that when Chinese President Jiang Zemin visited the White House last October, "the message it sent across the country is that finally these two great nations are now friends. That's very simple, but it's a very vivid and very important message to the Chinese." Few Americans would rank the Chinese, or at least the Chinese political leadership, as friends, however. Allegations that the Chinese military illegally contributed money to the Democratic Party and that Clinton was swayed by these contributions and other money to aid the Chinese missile program have cast a pall over the trip and given an opening to his critics, who have asked him to abandon it. But aside from the blow to international relations such a cancellation would cause, Clinton has no intention of passing up an opportunity to push greater trade with China. Even though in the campaign of 1992, Clinton savaged George Bush for his policy of economic engagement with China at the expense of pushing a human rights agenda, Clinton quickly adopted Bush's policy when elected. This has proved beneficial for both the Chinese and American economies. And White House political operatives are well aware that Clinton's poll numbers remain high largely because the American economy remains strong. "Good times cuts us a lot of slack," one White House aide told me.